What is Lyme? “Lyme disease, or borreliosis, is an emerging infectious disease caused by bacteria belonging to the genus Borrelia. Borrelia burgdorferi is the predominant cause of Lyme disease in the United States, whereas Borrelia afzelii and Borrelia garinii are implicated in most European cases. Lyme disease is the most common tick-borne disease in the Northern Hemisphere. It is transmitted to humans by the bite of infected hard ticks belonging to several species of the genus Ixodes. Early manifestations of infection may include fever, headache, fatigue, depression, and a characteristic skin rash that is reddened and called erythema migrans. Left untreated, late manifestations that involving the joints, heart, and nervous system can occur. In a majority of cases, symptoms can be eliminated with antibiotics, Diagnosis and treatment should occur early in the course of illness. Late, delayed, or inadequate treatment can lead to late manifestations of Lyme disease that can be disabling and difficult to treat. 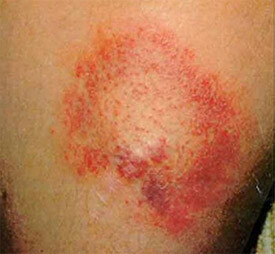 People sometimes confuse Lyme Disease with a Poison Oak or Poison Ivy rash. I asked one of the Herbal Studies Course students, Carol Simon, if she would discuss this and here is the response. In regards to Lyme Disease and tick bites, the best remedy again is prevention. Wear light-colored clothing. Maybe the medical profession will someday design a preventative pill like they give to our pets that would prevent the tick from biting. But for now, Prevention is the key. Carol Simon goes on to say, “ticks are another story. There are four species most commonly found in her area (Pennsylvania). Of these, the American dog tick and the Blacklegged Tick (Ixodes scapularis) are the most prevalent. It is suggested that the best way to keep ticks from attaching is to stay away from wooded areas and places with high grasses and brush. Wear light-colored clothes, long sleeves, a hat and use tick repellent. Always check your body for ticks after being outside in a tick-prone area and/or if you have pets that run outside. It is important to scan your body after being in any of the commonly tick-infested areas as the longer the tick is attached the more likely a disease will be transmitted. History & Background: I personally have never treated anyone for this disease – and what I am about to write is an investigation of the problems, interviews with people who have treated it and the possible herbs and essential oils that can be used to alleviate and reduce the symptoms and other palliatives while you are going to our physician for antibiotic treatment. Always combine both the conventional and aromatic/herbal medicines for best results. Lyme disease outbreaks rose in the northeast U.S. (1975) when the deer predators were mostly eliminated and the deer population exploded leading to the explosion of deer ticks and their tiny …”nymphal offspring that tend to acquire and pass the Borrelia bacterium to the human bloodstream.” See pages 116-118 in William Stolzenburg’s book, Where The Wild Things Were, for a discussion of why we need predators to maintain a healthy environment. Cleanse all the organs with as many of these herbs as possible, start slowly, do not start with all of them at once. Try some of the special items that are listed on the website at the Special Order area. Essential Oils – Anti-fungal, antibacterial and antiviral essential oils can be both applied and taken internally. These include Rosemary, Oregano CT carvacrol. The essential oils should be taken diluted – 2 drops in a capsule of olive oil. Essential oils can also be inhaled for calming and relaxation. Use the oils that are in the Stress Relief Kit. Baths/Lotions - Take hot baths with Epsom salts, baking soda, clay, Seaweed and herbal infusions such as Rosemary and Marjoram as these will assist the body to remove toxins.1 Bugle Weed (Ajuga reptans) can be used in the bath or taken as a tea.1 It is good for neutralizing heavy metal poisons.1 Bugleweed is a specific for over-active thyroid glands, and it will aid the weak heart where there is associated build-up of water.3 The Herbal Body Book by Jeanne Rose is an excellent resource for the use of herbs in cleaning and healing the body. Find an expert in acupuncture and see what they recommend. Diet & Foods – Eat vegetables to alkalize your body. Lyme spirochetes like yeast, so stay away from refined foods and white foods. Reduce carbohydrates in your body such as pasta, rice and bread. Stay away from trans-fats, most fats except for Olive oil. “Cleanse the bowels with fibrous foods that include whole grain, nuts, seeds and fruits.”1 Build up your immune system with healthy living. Eat Purslane as it is high in essential fatty acids. Confront Borrelia head-on and take what you need to fight the bacteria. Carrots, tomatoes juiced with plenty of garlic. Thyme, Hops, Oregano and Rosemary are also good herbs to use as food or herbal supplements. Here is where your home garden really comes in handy. Visualization & Meditation. Use these techniques to help yourself heal. Imagery (with visualization and meditation) provides a way to communicate with your subconscious mind. When you "see" an image in your mind it is a collaboration between your conscious and subconscious. The image you see will always be different from what others see because it is formed from your own memories and experiences. Imagery is like a personalized, guided dream with emotions. The recommended therapy to combat stress and its attendant harm upon our bodies and minds is to ‘relax and lighten up.’ Sounds simple enough to me, but when we look at this more deeply, we are merely prescribing a regimen that is bound to fail as therapy. When you inhale scent it is vaporized into molecules as a gas. The molecules are inhaled up the nose; absorbed by the sensory mucosa, sent to the olfactory nerve that directly affects the limbic system and hypothalamus. The limbic system is the seat of memory, learning and emotion. These molecules are also affecting the intellectual process. The hypothalamus affects the pituitary and has control of aggression. The pituitary affects the adrenal and sexual glands, which has effects on the sexual response. These are all interacting dynamics. What you inhale is what you are - so inhale pure aromatic oils such as those in the Mediation and Stress Relief kits. Use the essential oils that will help you to relax and to ‘get inside yourself’. These essential oils will be the stress-relieving ones (see the Stress Relief Kit) or the ancient oils (see the Meditation Kit). Use them every day for at least 10-15 minutes to relax and assist the healing in the body. “I just wanted to write on the value of the Seasonal Herbal section of the Herbal Studies Course. Two weeks ago I went camping for a week and acquired an annoying insect bite on my arm. It was itchy and sore and had a black center. I didn't think much about it until it turned into a perfect purplish/red circle. Ironically, I was doing research for Chapter 8 in the Seasonal Herbal on Lyme disease. I pulled up an image on Lyme disease and there was the exact picture of my bite! I called the doctor the next day and got on antibiotics. The bite has since healed but I just wanted to share this important story. Perfect timing!” …Betsy L.
1. Carol Simon of Berks County, Pa is an avid student of anything herbal and is currently enrolled in Jeanne Rose’s Institute of Aromatic Studies. Carol studied horticulture at the Barnes Foundation in Merion, PA and Longwood Gardens in Chadds Ford, PA and is certified in several holistic healing modalities. Carol plans to share her knowledge and love of plants by offering workshops for women to empower them with the wonders and gifts of Nature. 2. Jeanne Rose is a herbalist/aromatherapist who changed the current practice of American herbalism when she began her public work in 1969 with the publication of her first book, Herbs & Things. She is an accomplished author of 24 books on herbs, distillation, botanical perfumery, and all things aromatic, a teacher of natural botanical perfumery, skin care and SPA formulas and a well-known academic enthusiast. She has led seminars and consulted about plants from the growing to distilling in her copper still to using them in SPA, perfume, and every imaginable way. Visit her at JeanneRose.net and read credentials. 3. David Hoffman is a well-known herbalist trained in England with several excellent books to his credit. of Vanishing Predators. Bloomsbury, New York, 2008. All rights reserved 2008. No part of this article may be used without prior permission from Jeanne Rose. Please Check back often as we add more articles to the Jeanne Rose Website!